Right after the presentations and especially during the breaks, the participants took the opportunity for in-depth discussions and to learn more about various CAN FD solutions live at the accompanying trade exhibition. We thank all speakers for their interesting lectures, as well as all the participants for their lively discussions and the very positive response. Two CAN pioneers Martin Litschel (ri), Vector, and moderator Holger Zeltwanger (le), CAN CiA, opened the event. Opportunity for the speakers to share experiences, Dr. Marc Schreiner from Daimler (le) and Tony Adamson from NXP (ri). Dr. Arthur Mutter from Bosch had intensive exchange to his demo "Plug-and-Secure communication for CAN". Final words by Peter Decker, CAN product manager at Vector, that a further CAN FD Symposium may follow. 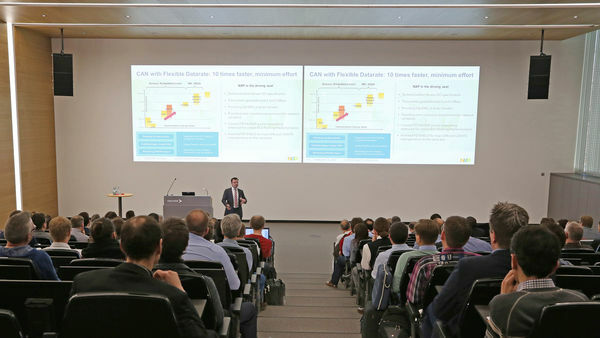 We would like to thank the event moderator Holger Zeltwanger, Managing Director and co-founder of the CAN in Automation e.V., who guided the participants throughout the day. Read here his report on the symposium.